Pack in the family fun, but keep it light with a Keystone Passport Travel Trailer. Crossroads Trailer Sales is your ultimate dealer for travel trailers in NJ. With so many great travel trailers to choose from, it can be hard to decide which type is right for you. The Keystone Passport Ultra Lite line of travel trailers is the perfect answer for active families who want to head out on the road to adventure without investing in a dedicated heavy-duty vehicle. The fully-equipped, innovative ultra lites are spacious enough for families, while remaining light enough to be towed with a crossover vehicle. 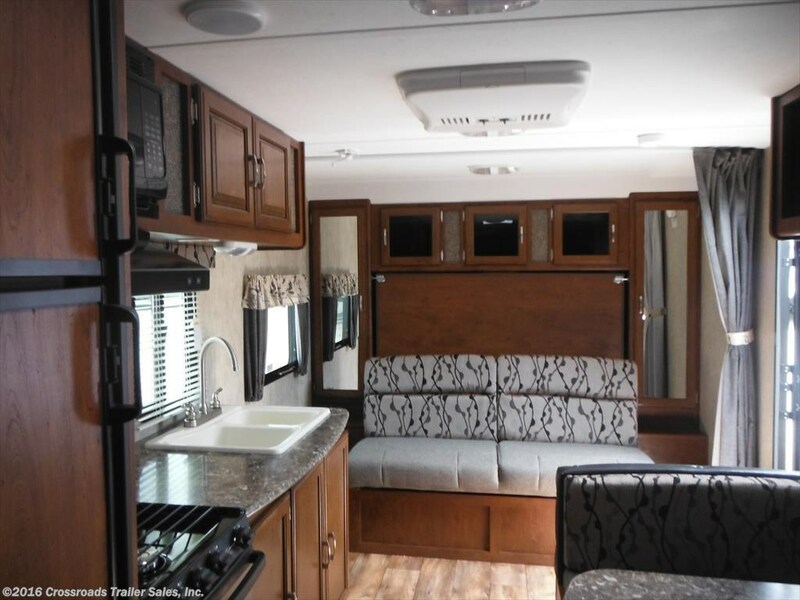 Since 1996 Keystone RV has not lost sight of founder Cole Davis’ vision to build a quality RV, loaded with features, but still priced thousands of dollars lower than comparable travel trailers. 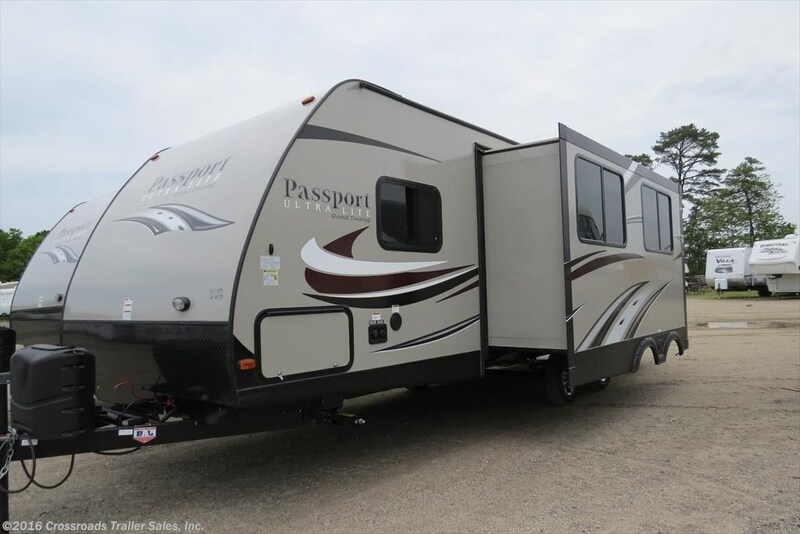 With more than 24 floor plans over three model lines– Express, Grand Touring and Elite – there’s a Keystone Passport Travel Trailer scaled to fit any size family – with cozy camping trailers for couples to bunkhouse models designed to sleep a crowd. No matter the sleeping capacity, each Keystone Passport Ultra Lite trailer comes loaded with comfort and quality without the weight – or the cost. From the Express to the Elite, the Keystone Passport’s stamp of quality, durability and value is apparent, from residential-style cabinetry and doors to oversized refrigerators to exterior speakers and expansive pass through storage. The Keystone Passport Express is ideal for families on the go who want to camp in comfort without breaking the bank – or over stressing a tow vehicle. The Keystone Passport Express is compact enough for easy towing and setup, while offering innovative floor plans and features. Ever expanding its commitment to family camping, Keystone has added an exciting line of expandable trailers that don’t scrimp on Keystone quality finishes – or sleeping room — while still staying light enough to tow with many SUVs and crossover vehicles. The Express – fully hard sided or expandable with durable fold-out tent sleeping quarters – is affordable without compromising Keystone construction and quality finishes. With stamped aluminum beam construction under laminated walls on the exterior and residential quality finishes in the interior, the Keystone Passport Express offers heavy value in an ultra lite package. Unlike many ultra lites, Keystone Passport Express models include complete bathrooms, with tub shower or radius shower, vanity and medicine chest, residential-style kitchens with home-like cabinetry and an oversize, double-door refrigerator. 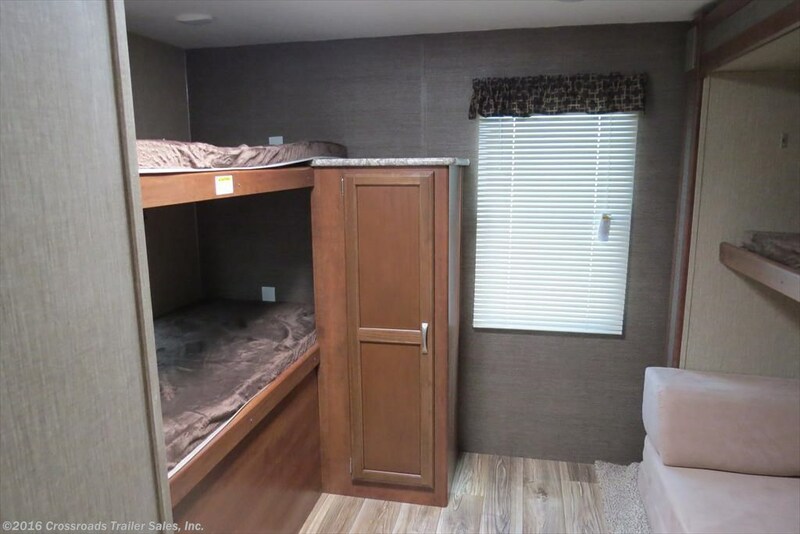 Throughout the trailer, find extensive storage and innovative interior design options, including a space-saving Murphy bed and up to three easy set-up fold out beds. Reach for the foldaway grab handle and step up the triple entry steps into a Keystone Passport Grand Touring model, which offers upgraded living without compromising towability. The Grand Touring models are true ultra lites, but with deep slide outs and added amenities, such as exterior kitchens and entertainment centers. 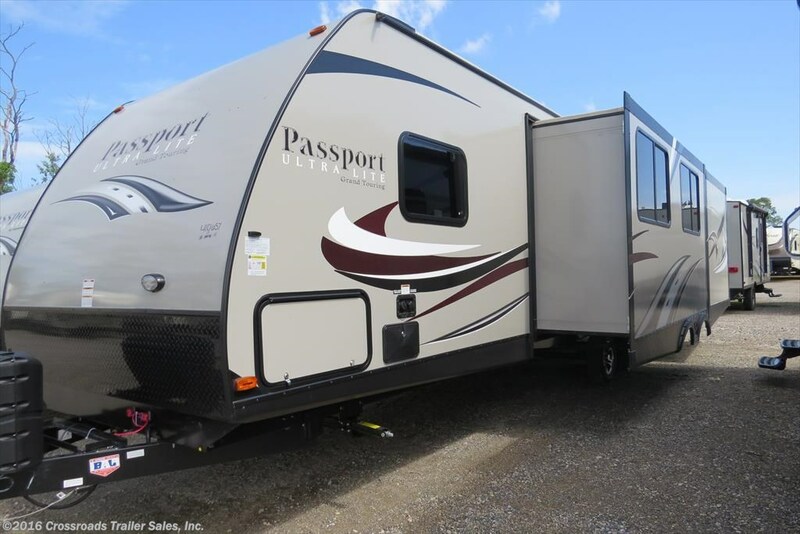 Keystone Passport Grand Touring models are ideal for family weekends or cross-country exploring, with easy setup, centralized control panels and floor plans that offer comfort by day and privacy by night. Larger kitchens with island or peninsula kitchens, Dometic double-door refrigerators, generous storage and large dinettes create the opportunity for memorable family meals. Then, gather family and friends on the sofa seating and enjoy movie night on the built-in entertainment center LED HDTV. Choose one of many bunkhouse plans to bed everyone down in comfort. Enjoy upgraded quality touches throughout, with residential Beauflor flooring, upgraded window treatments, glass shower doors in some models, and an entertainment center with hidden pocket doors. Go heavy on luxury, but stay light in weight with a Keystone Passport Elite. With models for upscale couples or families who crave an extra measure of comfort, look to one of the Keystone Passport Elite models. 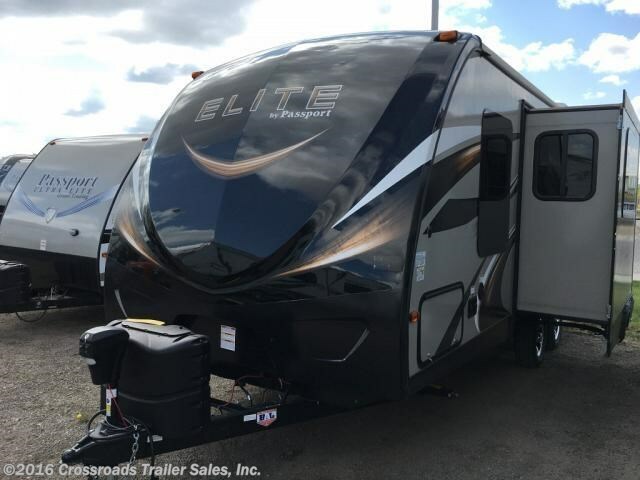 While the Keystone Passport Express and Grand Touring offer comfort and luxury unexpected in their weight and price class, the Elite kicks it up yet another notch. Built similarly to its sister models, the Elite features stamped, galvanized crowned trusses, enclosed under belly and aluminum framed walls and a lighter, stronger PACO I-beam construction. Eye-catching frameless windows and upgraded exterior graphics make the Keystone Passport Elite distinctive. Inside, find solid surface counter tops, pendant lighting, stainless steel appliances in the kitchen. Upgraded interior walls, distinctive designer window treatments and upgraded flooring throughout the Elite. 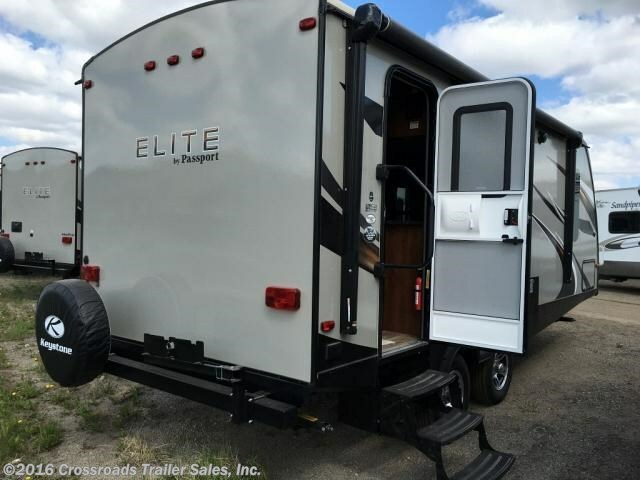 Like the Express and Grand Touring, the Elite is available in models suitable for a couple or multi-generational camping. Despite it’s luxury finishes, the Elite remains ultra lite for ease and affordability in towing. A Keystone Passport Ultra Lite travel trailer is a quality, affordable on-ramp to the exciting world of family camping. 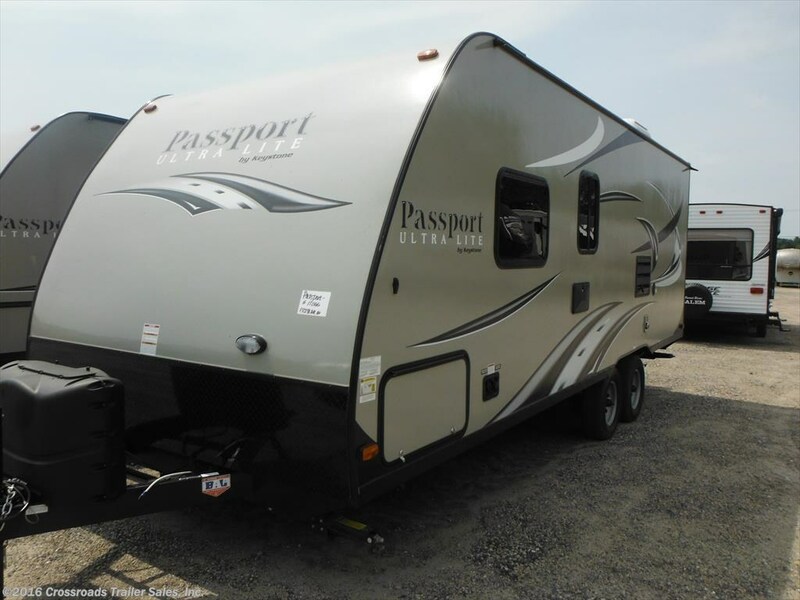 For new or used travel trailer sales, parts, service, and more, visit Crossroads Trailer Sales in New Jersey, where our RV camping experts can help your family find the perfect Keystone Passport. 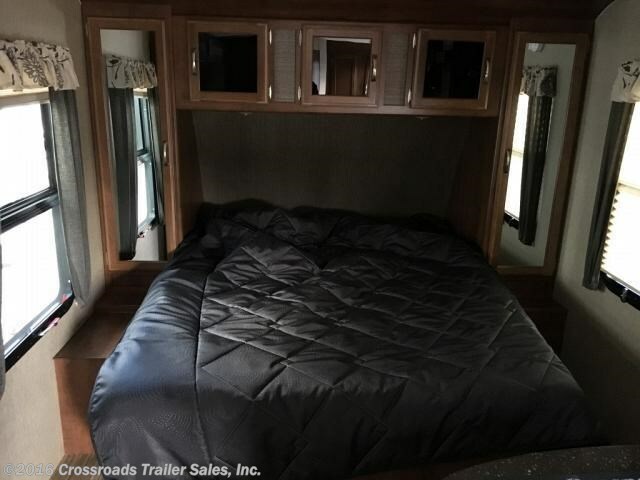 This entry was posted in Featured Brand, Featured Units and tagged featured model, keystone, keystone passport, passport, rv spotlight, travel trailer by admin. Bookmark the permalink.